Wasps are distinguishable from bees by their pointed lower abdomens and the narrow “waist,” called a petiole, that separates the abdomen from the thorax. All wasps build nests from wood fibers chewed into pulp to resemble a paper looking nest, whereas bees secrete a waxy substance to construct their nests. Wasps can either be social or solitary. Some wasp species are aggressive and will sting if they are threatened. Unlike honey bees, wasps are capable of stinging multiple times. Wasps are used in agriculture to control pests and some wasps are pollinators and help with plant fertilization. Typically, wasps build their nests outside in residential areas. Although, wasps will get indoors by accident or when looking for nesting sites, food sources or a place to hibernate in the winter. Generally, wasps get in through openings that lead inside our homes and commercial buildings. 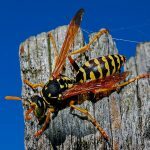 An indoor infestation generally will not occur unless wasps can gain entry to walls, attic spaces, etc to build their nest. Wasps that nest inside may cause damage to wallboard or ceilings.